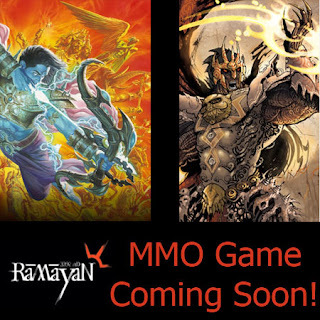 India's rapidly growing Gaming market which is expected to top 200 million dollars by 2010 has attracted Sony's attention.Sony Online Entertainment has joined up with Sir Richard Branson and Deepak Chopra's Virgin Comics to create a PC MMO(massively multi-player online video game) based on the comic book universe of Ramayana 3392 A.D, first released in 2006.The deal was announced today by John Smedley, President of SOE and Sharad Devarajan, Co-Founder and CEO of Virgin Comics. Virgin Comics' Ramayana 3392 A.D., initially released as a comic in late 2006, re-imagines one of India's greatest epics into a futuristic realm.Gotham Chopra, Virgin Comics' Chief Creative Officer commented, "While many of the characters and settings remain familiar to the original lore, we never intended to re-tell the story, but essentially use it as the key inspiration for something fresh. What remains intact to our story are some of the core universal themes like duty, honor, sacrifice, and fraternity while also mining uniquely Indian ideas like karma (how action and consequence are linked) and the malleability of time itself. To bring all of these ideas into a game with SOE is just awesome." Virgin's creative involvement with SOE's game development team will be spearheaded by its President and head, Suresh Seetharaman, who has also overseen the development of the comic series. Also involved is acclaimed filmmaker Shekhar Kapur, a co-founder of Virgin Comics. platform through which to speak to the world. Through this collaboration with the like minded visionaries at SOE, our young Indian creators will make gaming history worldwide."